The Audemars Piguet Royal Oak ‘Jumbo’, or ref.15202ST has always been one of our favorite – perhaps even the favorite – stainless steel luxury sports watches. Designed by Genta, this watch already has seen a lot of coverage here at Fratellowatches (most popular topics here, here and here). During the SIHH 2012 in Geneva, Audemars Piguet introduced an appropriate successor of the current ‘Jumbo’ ref.15202ST, the ‘Jumbo’ ref.15202ST. That’s right, nothing changes in the naming or reference number, only the watch itself changes a tiny bit. Changed in a good way, as a lot of collectors and enthusiasts have longed for these changes for quite some time. With this new version, AP took this watch back to its original roots of 1972, with the company’s logo located at 6 o’clock. The date wheel has been painted black (instead of white) and the tapisserie has become a bit smaller. Additionally, AP dropped the printed Arabic numerals above the hour markers and made these hour markers a bit longer. The white frame around the date aperture also disappeared. What stayed, is the size of 39mm in diameter – it wears a tad bit larger though – and the beautiful caliber 2121 (based on the 2120, which had no date). This movement is still derrived from Jaeger-LeCoultre’s caliber 920, as introduced in 1969. Patek Philippe and Vacheron Constantin also used this movement for a long time, but Audemars Piguet is the manufacture entitled to use it (in license). The engraving on the rotor changed a bit, AP seems to have added a ‘hobnail’ motif to the massive gold weight. Above, you’ll see a photo or RJ’s 2006 ref.15202ST Royal Oak, the current ‘Jumbo’ with charcoal dial. 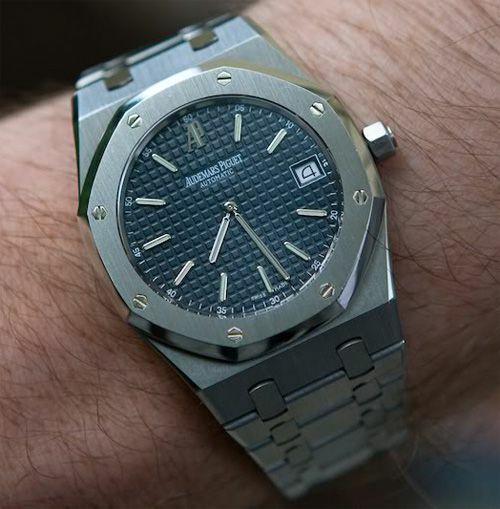 There is no update yet on availability and pricing of the new AP Royal Oak Jumbo. 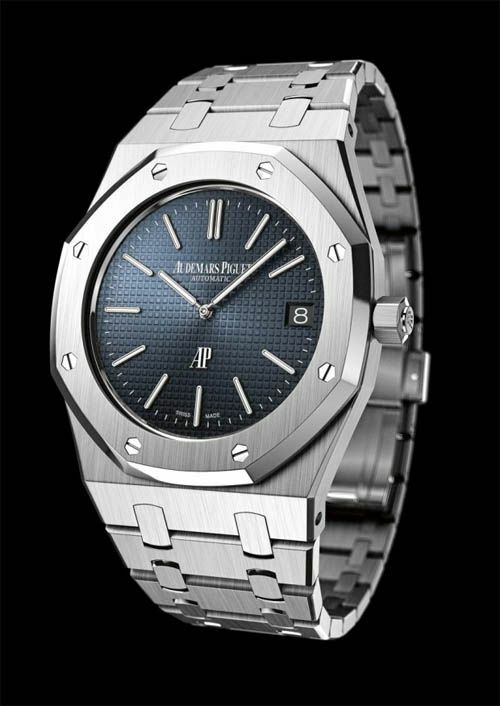 The current AP RO Jumbo ref.15202ST has a list price of 17900,- EUR. We suspect that the new AP RO Jumbo will have an even more serious price tag. Nevertheless, we are impressed by the new Jumbo. Live photos of the new Royal Oak can be admired in this post at Hodinkee. More live photos of the SIHH 2012 can be found at Watchlounge, here. The AP special photo report by Paul Boutros is also definitely worth visiting, click here.